We cultivate teaching staff members who are capable of leading-edge international research, and who are also able to mentor junior researchers. During their tenure track period, researchers belong to the Institute of Innovative Science and Technology (IIST), a newly established separate entity within the university and an ideal research environment for bringing out their best performance. After obtaining tenure (full-time position), they are attached to a faculty or graduate school as incentivized teaching staff where, through their research, they nurture the next generation of mentor researchers. 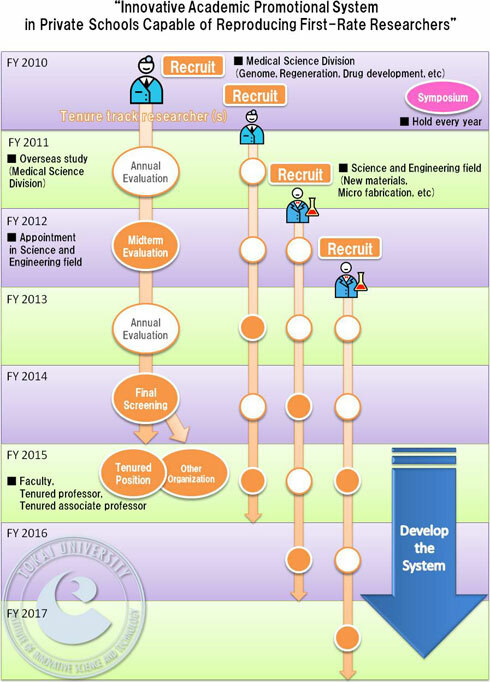 Tokai University has started to introduce the system in the Medical Science Division. The plan is then to utilize this experience from FY2012 as its third year in extending the system to cover Science and Engineering field, and later, through institutional reform, all fields of study. In the Medical Science Division, the aim is to cultivate researchers of a mentor level in five years, including compulsory overseas study in a designated US program. In the field of Science and Engineering, researcher development will be carried out by many tutors through a “strategic” curriculum that covers intellectual property, research ethics, collaborative research norms, educational teaching methods, and more. The progress will be evaluated annually by the IIST while a midterm evaluation will be made in the third year through a rigorous assessment of the ability and performance of the researcher. To obtain tenure, researchers will undergo a strict screening of their research achievements by a panel that includes external evaluators. In addition, a tenure framework is firmly in place to cover mandatory retirement and transfers that may occur in the future. We accept tenure track researchers at the institute on an annual contract basis, and in the third year (2012) we will carry out a midterm evaluation of the tenure track researchers accepted in the first year. From the third year, utilizing our experience in the Medical Science Division, we will start to introduce tenure track researchers in the Science and Engineering field as well. At the end of the third year, six tenure track researchers will enroll. In the Medical Science Division, we will create a strong lineup when developing this program in our own way with our own university personnel. At the end of the fifth year, we will establish the basis for developing the same kind of system in other specialist fields of Tokai University. After the implementation period is over, researchers who have received tenure and become qualified as mentor researchers, along with those who have nearly done so, will join the present teaching staff where they can take the lead in developing this program within the university. Support will be aimed at “importing seeds (mentors)” who will build a program cycle until a self-supporting system of “seeds bearing fruit, and fruit producing seeds” is established. Moreover, we wholly support the system of recruiting foreign staff and female staff in every subject of study. We already have rich experience in the development of a female research support model, and measures for assisting new female researchers are firmly in place in every subject.